New York, NY – June 19, 2013 – Arts Horizons, the arts-in-education organization that has provided arts programming to nine million students throughout the tri-state area since 1978, in collaboration with the Port Authority of New York and New Jersey, today cut the debut ribbon on the colorful, gigantic “Art Beyond the Horizons” Mural that will beautify the 8th Avenue/40th Street entrance at the Port Authority Bus Terminal in New York, NY for a full year. 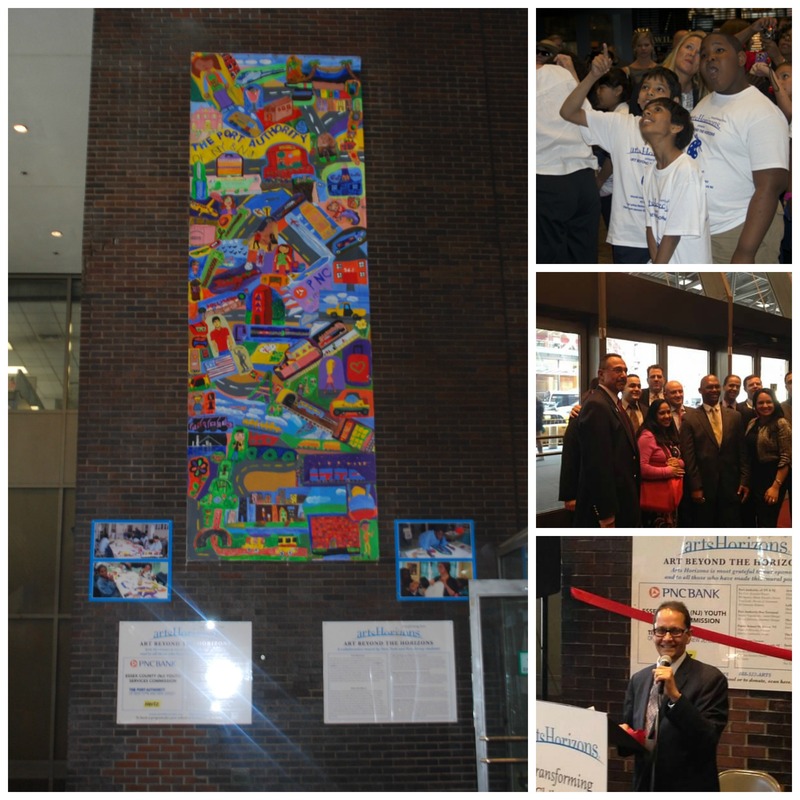 The third collaboration between Arts Horizons and the Port Authority, the spectacular, color-saturated 18’ x 6’ vertical mural on canvas, brings together the talents of school children from three locations – all within a 15-mile radius of the famed transportation hub, which serves more than 67 million people annually. Under the supervision of Arts Horizons teaching artists Kit Sailer and Donovan Nelson, students from PS 94 in the Bronx, the Mount Vernon Elementary School in Newark, and the Arts Horizons LeRoy Neiman Art Center in Harlem, have come together to create a whimsical vision of transportation in the 21st Century and how travel is a bridge between culture. Some of the mural’s colorful voyagers created by the participating students include a celebrity show dog that lives in a chocolate cupcake mansion and travels everywhere by limo; and a Super-Hero/High School teacher with X-ray vision, who saves lives and travels with a book bag containing his cape and mask. Through a grant from the Essex County (NJ) Youth Services Commission and generous sponsorships by PNC Bank and Hertz, “Art Beyond the Horizons” celebrates the diversity of the New York/Metropolitan region, and allows onlookers to view the mural and imagine the comings and goings of the characters — all intersecting at one of the most famous nexus points on the planet. The mural also underscores the importance of displaying art in public places and its positive and calmative effect on the general public – especially in a city as busy and bustling as New York. The project underscores the close relationship between New York and New Jersey, and was championed by the late Senator Frank Lautenberg, and is currently endorsed by Newark Mayor Corey Booker, and New York City School Chancellor Dennis Wolcott. The “Art Beyond the Horizons” mural is an 18-foot vertical canvas consisting of brightly-colored paintings of people, places, and modes of transport, interspersed throughout a colorful backdrop portraying the urban sprawl of New York and New Jersey. Under the supervision of Arts Horizons teaching artists Kit Sailer and Donovan Nelson, the components were created over a 3-month period by students at PS 94 in the Bronx, the Mount Vernon Elementary School in Newark, and the Arts Horizons LeRoy Neiman Art Center in Harlem. At a reception on Wednesday, June 19 at 11:00 AM in the 8th Avenue/40th Street entranceway at the Port Authority Bus Terminal, Paul King, Executive Director of the Office of the Arts for the NYC Department of Education, was a guest speaker. Additional guests included more than 30 student-artists who participated in the mural project, their proud parents, teachers and school principals, Arts Horizons board members, executives from the Port Authority, and mural artists Kit Sailer and Donovan Nelson. After today’s opening reception, the mural will hang in the 8th Avenue/40th Street entrance to the Port Authority Bus Terminal for a full year. To learn more about Arts Horizons, please visit: www.artshorizons.org. To schedule a program contact info@artshorizons.org or call 888-522-ARTS.